Model T Ford Forum: Hastings Real Glass Window for touring car. Seen these? 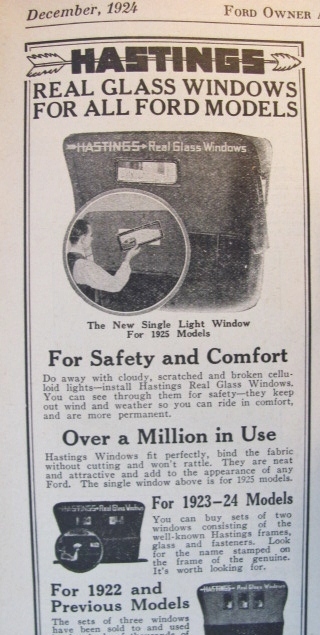 Hastings Real Glass Window for touring car. Seen these? 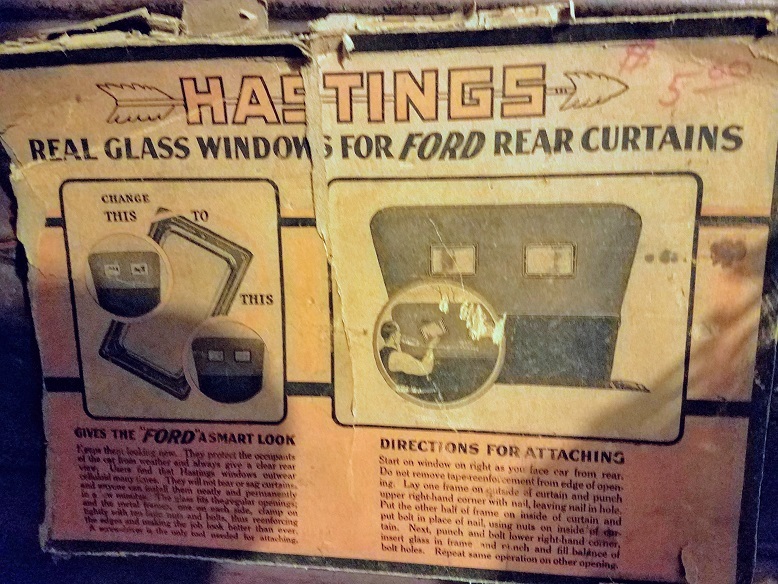 Model T Ford Forum: Forum 2018: Hastings Real Glass Window for touring car. Seen these? I'm pretty good with those interwebs, and I can't find any reference to this kit I found. 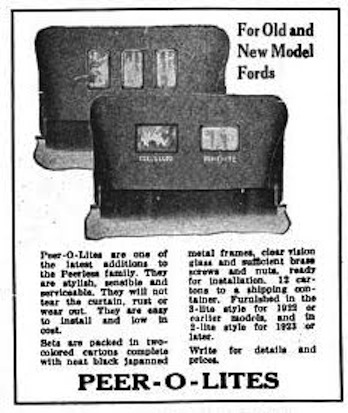 Here you go..these were made to retro fit into the old Ford isinglass plastic like windows. Comes with tiny screw bolts to punch the fabric and fasten the metal frame with its glass into the top rear curtain. Used to find these frames at all the swap meets in past years. Thats ad is great! This kit is complete with the frames and 2 pieces of glass! They come up for sale on ebay somewhat often. If it were me I would swap out the glass for something safer. Those are very common, both used and NOS. They were a popular accessory. My dad put an NOS set on his '17 touring almost 70 years ago, I think he has another NOS set sitting on the shelf. I have some in my parts stash. I have seen them on a number of Model Ts. I also run across them at swap meets. I have one on my '27 and love it! Does anybody know if the frames for the three vertical windows (1917-22) are the same size as the frames for the two horizontal windows (1923-24 and early 1925)? In other words, are the same frames used for both 1917-22 and 1923-25 but merely oriented differently? They were designed to be installed in the rear curtain without altering the existing openings. In Dan Trace's photo above as well as ads in trade journals, the frames for 1923-25 appear to be different dimensions from the 1917-22 and less rectangular. I have some that are definitely correct the three window rear curtain - I have matched set of three that are unmarked, and two that are marked Corcoran Mgf. Peer-O-Lites Cincinnati, O. My dad has a set of three Hastings on his '17 touring car. The outer measurements are of the unmarked and Peer-O-Lites are 10 3/4" x 6 1/2". I presume the Hastings three window frame measurements on my dad's car are the same. According to McCalley, 1917-22 windows were 9 1/2" x 5 1/4" and 1923-early 1925 were 8 1/2" x 5 1/2". I presume he is referring only to the openings, and the measurement does not include reinforcement binding around the openings.